Swimming has never been my best-loved sport but ever since I became a mum, the pool has become one of my favourite places to hang out with the kids. Why? Well, let's just say I have yet to meet a kid who doesn't like to get wet and splash around, and the two lively girls I have simply love, love, looovvveee to be in the water. So, ever since Angel was an infant and we were still living in Sweden, we made swimming a regular family activity. Now that we are back in the tropics, we also like to bring the kids to the beach or have fun at the water playgrounds. Now, with two water babies, what is one concern I have as a mum? 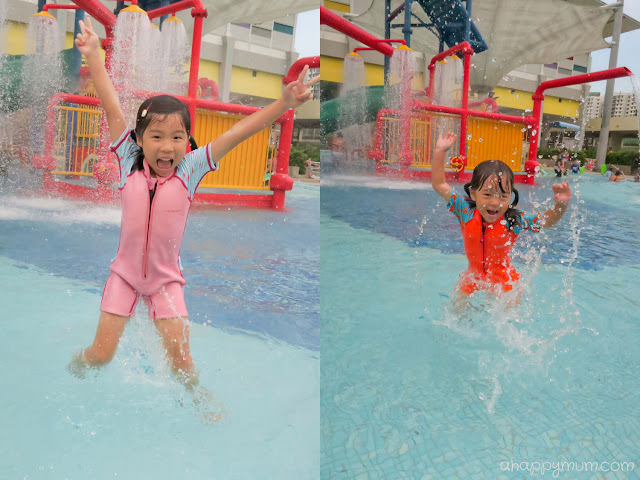 It is how to keep them warm and safe in the midst of cool and fun water play. I've been trying to cut down on reviews recently but when Cheekaaboo wrote in and offered to send the kids protective swimwear, I knew this was an opportunity I would not want to miss because I do think it is essential to learn to better protect my kids while letting them swim, splash and just enjoy being in the water and under the sun. Cheekaaboo offers a unique collection of fun and vibrant protective swimwear and floaties designed for the comfort of precious little ones. Not just average fashionable swimwear, these are premium swimwear catered for infants and toddlers. Yes, the baby has a swimsuit waiting for him even before he arrives! We picked out these from Cheekaaboo's online store and initially, I was a little worried about the fit as the sizes sounded quite broad in range and it was not possible to let them try on beforehand. So it came as a pleasant surprise when the suits fitted both the girls quite nicely. Do note that the suits should be snug and not loose in order to provide maximum warmth and protection. Don't the designs of the swimwear look so vibrant and appealing? Angel was thrilled with her pink suit that came with sweet cherry prints on the sleeves and girly ruffle at the back. Ariel chose to go with the bright, striking orange suit that had cute starfish prints on the sleeves. Apart from the designs, I was more concerned about the functions so it was reassuring to know that Cheekaaboo uses high quality neoprene material in their suits which have insulating properties. I hope it's not only me when I say that my kids usually shiver when we move from pool to pool or when we pack up to proceed to the bathroom. Sometimes, it gets a little worrying as the toddler's lips might even turn purple when she gets too cold. So, it is definitely important for me to keep them warm, not just in water but also out of it. How it works is that the neoprene helps to trap water between the suits and the skin to create a layer of insulation from the cold. The material is chlorine resistant and offers 100% UV protection on covered areas. I personally prefer the one piece suits over the two piece ones as I find that these are easy to put on and offer extra protection. While I like the fact that the swimsuits keep them warm, I was apprehensive of whether the material would restrict their movement in water which would the last thing the girls would want. So I got them to test out the suits a couple of times and was relieved to know that they were still free to move around and do whatever they like. The good thing about the neoprene material is that it is soft and only 2mm in thickness. When I asked them for feedback, the little one did complain a little about discomfort in the crotch area but I figured out it might be because the suit was a still a tad long for her. On the other hand, the big sister totally loved hers, felt extremely happy and comfortable in it, and couldn't wait to show it to her swimming classmates. Lastly, just to take the test further, the kids not only swam and played while clad in the suits, they also tried to jump too! Seeing their wild movements and big smiles, I think they definitely like wearing their new swimsuits and for me as a mum, I am just happy to know that they are better protected than before. Infant swimming lessons have been documented to potentially increase a child’s mental capacity, intelligence and concentration. It helps build positive development on social skills, emotions and physical. Above all, swimming offers immeasurable bonding effects between parents and child. So what are we all waiting for? Let's go to the pool and have some splashing fun today! P.S. Swimming is one of the best and safest exercises for preggies, right? I'm definitely cherishing this feeling of having fun with my two girls in the pool before the baby pops! To find out more about Cheekaaboo or visit their online store, visit www.cheekaaboo.com. Great news, Cheekaaboo is giving away a Cheekaaboo Merchandise of your choice to ONE lucky winner! ALL participants in the giveaway will receive an exclusive 20% Cheekaaboo Discount Voucher and free shipping will also be provided for the first 10 participants who purchase. 1) Surf up to Cheekaaboo's new website here and check out their products at their online shop. 2) Found what you like? Now, click on this link to fill in your details in the form, answer a simple question about Cheekaaboo's product and share your First Cheekaaboo Wish. That's all! To find out if you’re the lucky winner, you can hop over to LIKE both A Happy Mum and Cheekaaboo on Facebook . Best of luck! - This giveaway ends at 2359hrs on 6 Dec and is open to readers residing in Singapore only. - The winner will be chosen randomly and must respond within 72 hours after being contacted by Cheekaaboo or a new winner will be drawn. -All participants will receive a 20% discount voucher code from Cheekaaboo at the end of the giveaway. Disclosure: We received complimentary swimwear products from Cheekaaboo in writing this review and giveaway. All opinions are our own. Great post. Nice dress for baby. It looks great, lightweight and compact. Thank's for sharing nice pic & tips. They look so happy! And I've never seen Surf and Splash so empty before! Hehe. I took part in your giveaway! Hahaha! Guess what, we went to three water parks and all three were closed on the day we went. Surf N Splash was under maintenance and we couldn't play in the water, luckily we still managed to take some pics before we left! =) Thanks for taking part!